In the late 1850s students at Haverford College had to pass exams in three departments: English, Classics, and Mathematics. They demonstrated their mastery in these divisions through a grueling set of exams at the end of the senior year. First they had to pass a battery of private exams that covered all the subjects and spanned two weeks. These private exams were followed by a set of public exams. 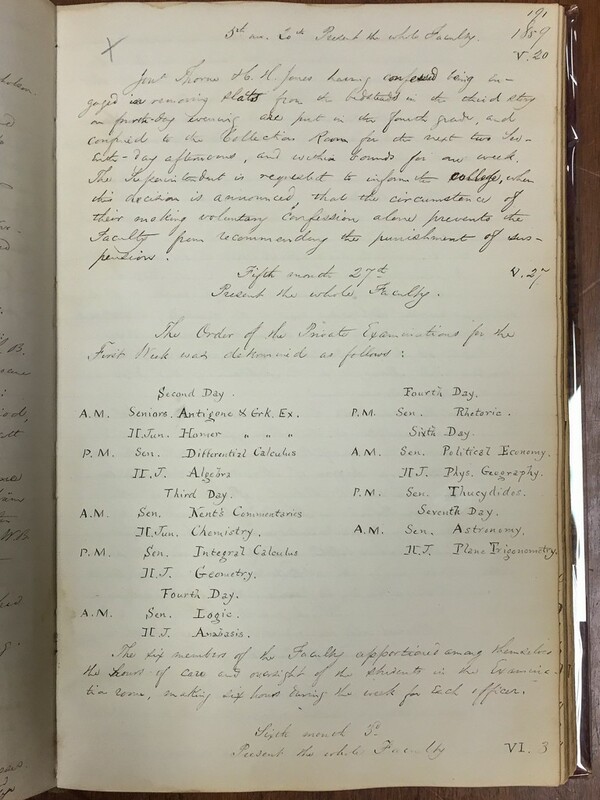 At the faculty meeting on May 27, 1859, the faculty determined the schedule for the first week of private exams that year. Nearly a month later the faculty got around to finalizing the second week’s exam schedule. The Minutes of the Faculty are found in Haverford Quaker & Special Collections, Call# HCV—R4 ID 1835–1869 (see the finding aid). Each exam was supposed to include a “series of written questions … [with] a number being annexed to each question, to represent the value assigned to a correct answer” and must include a “suitable number of questions” to test the students’ mastery. Each day students filed into the examination room where under the watchful eye of a faculty member they were prohibited from talking to each other while they took the exam. Exams lasted up to four hours. XII The papers containing the answers, must not be signed with the students [sic] name, but with a name or motto, assumed for the occasion; and a sealed envelope, inscribed with said assumed name, and containing the real one, must be handed in to the first meeting of the council, after the merit of the answers has been determined. Crocket, H. St. John, Mohawk, O!, Kit Carson, Incog., Imparatus, No Anxiety, Anxietas, √–1. Equally predictably, others viewed it as a tedious task, choosing something trite—Greek letters were common, e.g., Omega and Beta were common. Aeneas, Tyro, Hesperus, Ajax, Hector, Themistocles, Ὄνομα, Ἑρμῆς, Ξένος, Παραδειγμα, Φευ φευ. Finally, and most interesting to me, some mottos seem to reflect a growing interest in astronomy, e.g., Regulus, Hipparchus, and most bluntly Telescope. In 1859 eight students took the private exams. The faculty always recorded student performances in the Minutes of the Faculty Meeting, listing both the student’s motto, his real name, and his grades in the three departments as well as his average. 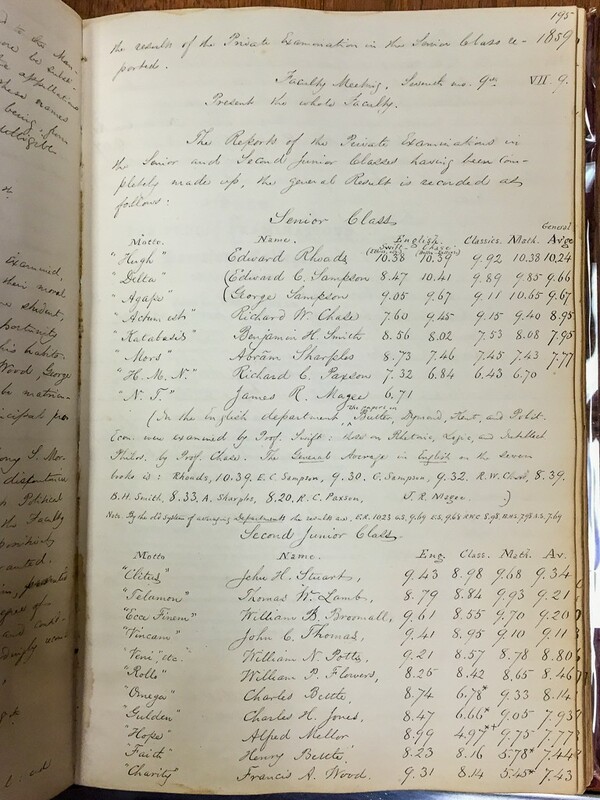 The Minutes of the Faculty are found in Haverford Quaker & Special Collections, Call# HCV—R4 ID 1835–1869 (see the finding aid). The Haverford College Catalogue lists the books seniors studied and the faculty who taught the various course. From the list of books and the public lectures faculty agreed to give, we glean some idea of what seniors were supposed to have learned. In the late 1850s Moses Stevens was responsible for teaching the mathematics, which was divided into three subjects: mechanical philosophy, optics, and physical and practical astronomy. For the first two subjects, students were assigned a book by Olmsted, perhaps Dennis Olmsted’s An Introduction to Natural Philosophy (1844)). For astronomy, they read a book by Robinson, probably Horatio Robinson’s A Treatise on Astronomy, Descriptive, Physical, and Practical (1850). 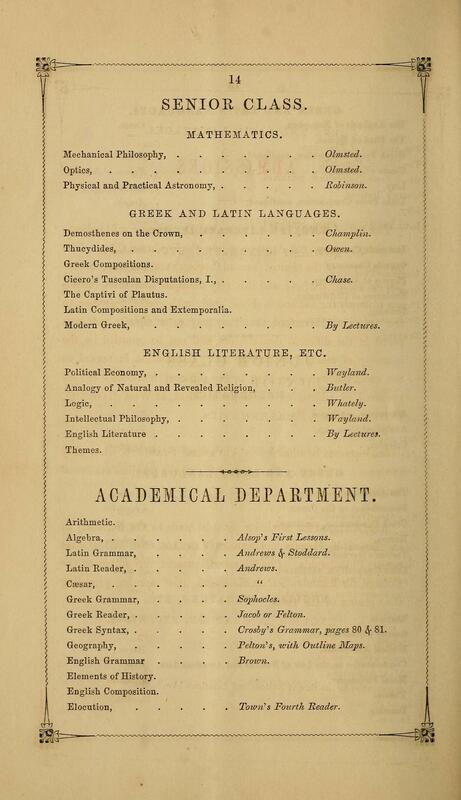 The Haverford College Catalogue for 1859 lists the books students read in the mathematics department. The books included a text by Olmsted on mechanical philosophy and optics, and a book by Robinson on astronomy. The Haverford College Catalogue for 1859 is available online here; this particular page is available here. 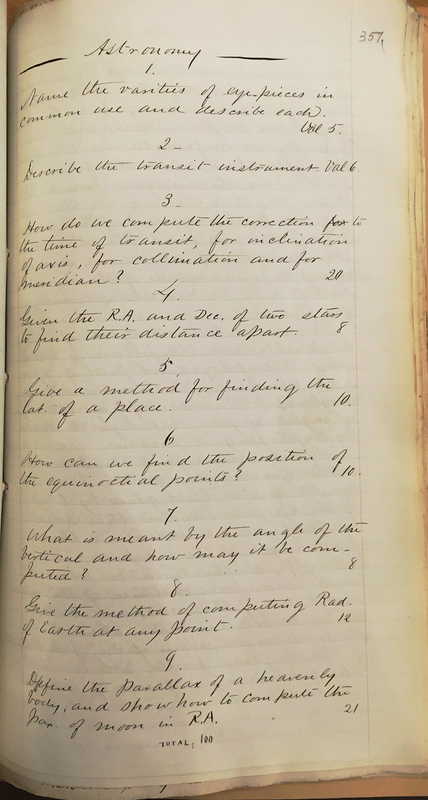 Although we don’t have Stevens’s lecture notes, we do have copies of the exams he gave the students in 1859 along with the students’ answers and marks on each section. Stevens divided mathematics into six areas and tested the students on each: Analytical Geometry, Differential Calculus, Integral Calculus, Mechanics, Astronomy, Optics. The first three the students learned as juniors; the second three they studied as seniors. Stevens tested the students in six areas. He recorded their grades in this summary table and then reported to the faculty the students’ general average on the battery of mathematics exams. Here, each area was worth 10pts for a maximum total of 60 pts. In some cases, students earned more than the maximum points—if their answers were particularly good, they could earn extra credit. The students were, apparently, most prepared for the optics exam and least prepared for the astronomy exam. 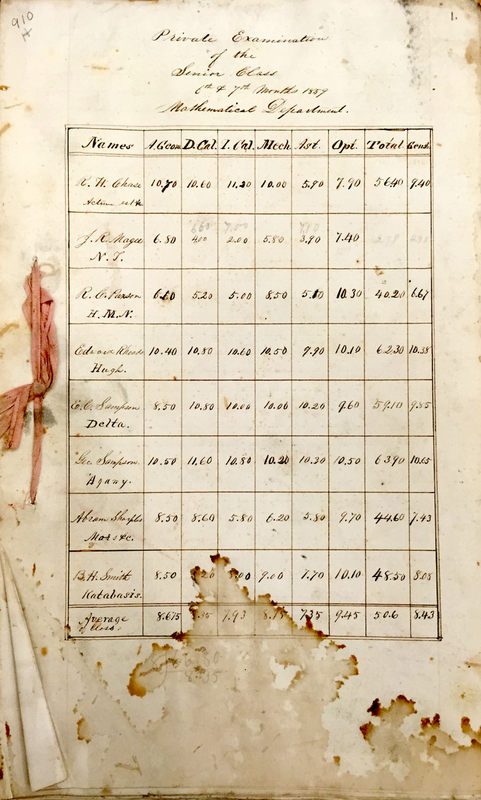 These exams are found in Haverford Quaker & Special Collections, Call# 910H (this collection of materials contains all sorts of fascinating stuff, see the finding aid). Although all the exams—both the exams for the various mathematical subjects and the different students’ exams in each subject—would repay study, here I’ll look at just one student’s responses to the astronomy exam. The student, “Katabasis”—Benjamin H. Smith was his real name—was an average student. He performed slightly better than average on the astronomy exam, but overall he was slightly below average. Name the varities [sic] of eye-pieces in common use and describe each. Val 5. Describe the transit instrument. Val 6. How do we compute the correction for to the time of transit, for inclination of axis, for collimation and for meridian? [Val] 20. Given the R.A. and Dec. of two stars to find their distance apart. [Val] 8. Give a method for finding the lat. of a place. [Val] 10. How can we find the position of the equinoctial points? [Val] 10. What is meant by the angle of the vertical and how may it be computed? [Val] 8. Give the method of computing Rad. of earth at any point. [Val] 12. Define the parallax of a heavenly body, and show how to computer the par. of moon in R.A. [Val] 21. Katabasis neatly copied out the astronomy examination questions. Minor spelling mistakes, e.g., “varities” for “varieties,” and abbreviations were common in the students’ copies of the questions. This exam is found in Haverford Quaker & Special Collections, Call# 910H (this collection of materials contains all sorts of fascinating stuff, see the finding aid). 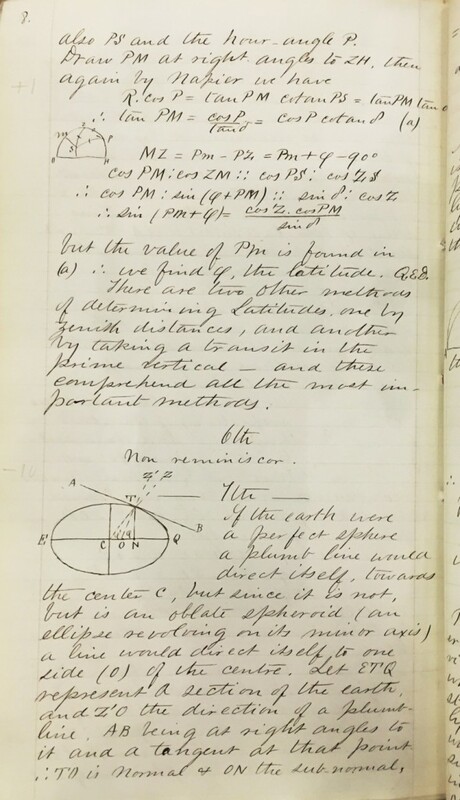 Although the three years of astronomy courses at Haverford used Robinson’s textbook, when Moses Stevens taught the course he had to supplement this material. For example, Robinson’s textbook said nothing about varieties of eye-pieces or transit instruments. Katabasis’ answer to question one seems to have come from Elias Loomis’s An Introduction to Practical Astronomy , which the college assigned a couple years later as the astronomy textbook. The order, the drawings, the terminology, and even the underlining in Katabasis’ answer echo that found in Loomis’s textbook. Perhaps equally telling, the unnecessary information and detail Katabasis added, e.g., when he described how to “find the power of the telescope,” is exactly the detail that follows Loomis’s discussion of eye-pieces. Katabasis’ answer to question one: “Name the varities [sic] of eye-pieces in common use and describe each.” It seems likely that the source of this information was Elias Loomis’s An Introduction to Practical Astronomy . This exam is found in Haverford Quaker & Special Collections, Call# 910H (this collection of materials contains all sorts of fascinating stuff, see the finding aid). It is easy to imagine one of two scenarios: First, Stevens turned to Loomis’s textbook to fill in important information he thought was missing from the assigned text. Haverford had, after all, built and equipped a new observatory that it prided itself on and required students to use. In such a case, basic, practical knowledge of the instruments would be useful. Second, Katabasis had for one reason or another not learned the information in class. To make up his deficiency he had consulted Loomis’s text during his six weeks of review prior to the exam. Although the college boasted that its students had plenty of opportunity to do astronomy in its new observatory, only the first two questions gave the students a chance to demonstrate their experience working with astronomical instruments. And even these two questions don’t require working with instruments so much as being able to describe their parts—neither required the tacit knowledge that students might gain only from working with instruments. Most of the exam asked students to explain how, in principle, to carry out certain astronomical calculations. Surprisingly absent from the exam were problems that asked the student to carry out astronomical calculations. Again, Katabasis’ answers to these latter questions seem to owe a debt to Loomis’s An Introduction to Practical Astronomy rather than Robinson’s text. For example, question 7 asks to define the “angle of the vertical” and show how to calculate it. This term is found nowhere in Robinson’s textbook. However, in Loomis’s text this problem is explained in terms remarkably similar to Katabasis’ answer, including the diagram that illustrates both Katabasis’ exam and Loomis’s textbook. Katabasis’ answer to question 7, “What is meant by the angle of the vertical and how may it be computed?” so closely resembles the example in Loomis’s textbook that it seems likely that Loomis, not Robinson, was being used in the classroom. This exam is found in Haverford Quaker & Special Collections, Call# 910H (this collection of materials contains all sorts of fascinating stuff, see the finding aid). The astronomy exam and Katabasis’ answers give us a glimpse of Haverford’s astronomy curriculum in the mid–19th century. Together they help us see beyond the prescribed curriculum and texts—in this case, his answers suggests that the prescribed text was not the primary resource used to teach astronomy. The exam questions also give us a chance to see what the college considered valuable astronomical knowledge. 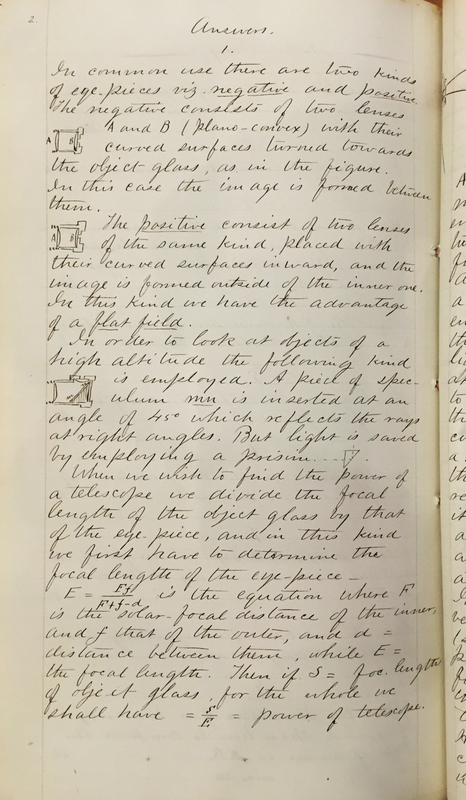 Considered alongside the other students’ exams and Katabasis’ own diary, we can perhaps begin to piece together a detailed picture of astronomy education at Haverford College in the mid–19th century. II. The Senior and 2d Junior Classes, will be allowed the six weeks next preceding the examination, for a general review of their studies….